By default, users will first be shown the Global settings when first arriving on the Settings page. Otherwise, Settings are organized in the left-hand menu alphabetically. To access the “Settings” menu in AtoM, click on the Admin menu in the main menu located in the header bar and select “Settings” from the drop-down menu. You will be redirected to the “Site Settings”, where a number of information areas, including the “Global” settings, which should be opened first by default. This section will describe each setting in the “Global” information area. Hovering over each setting field will also provide additional information on that field - it will appear in an “information box” below your cursor. The second number after the dash represents the database schema version. This can be useful information to include in a support message if you are experiencing unexpected issues with your installation - if a system administrator forgets to run the upgrade task as part of a site upgrade this can lead to missing tables and/or columns in the database, which can cause unexpected errors later when trying to use AtoM. If yes is selected, authenticated (i.e. logged in) users will automatically receive a notification if a newer version of the AtoM software has been released and can be installed. This notification will appear in the browser for authenticated (i.e. logged in) users, as an orange bar across the top of the application alerting users to the newest release available. By default, AtoM lists objects in list pages and search results ten at a time, with a pager at the bottom of the page to allow users to navigate through long lists of objects. Administrators can increase or decrease this default number. Note that the minimum accepted value is 5 results per page, and the max value is 100. Date modified: Will sort based on the date the records were created or last modified. 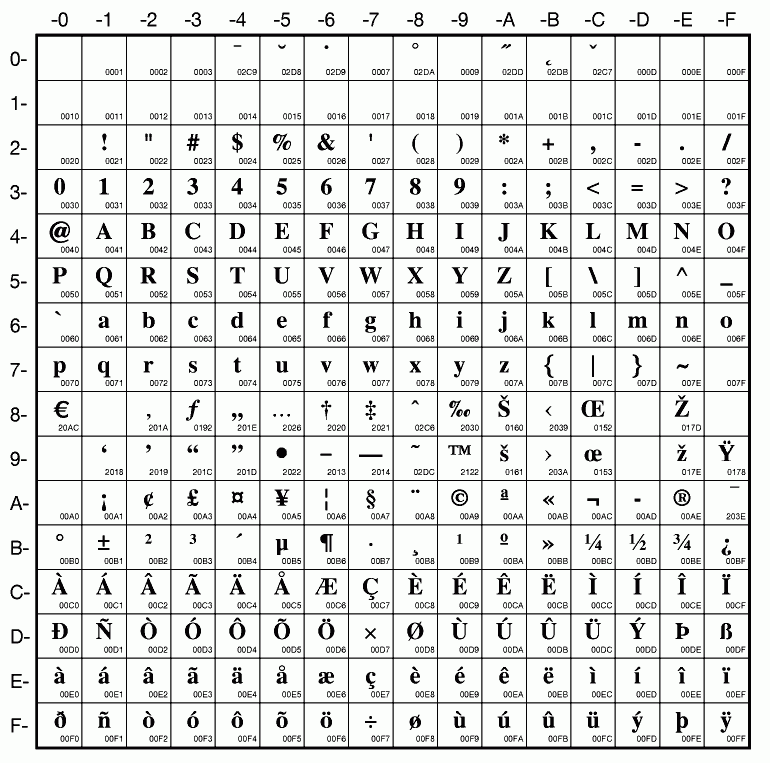 The Title/name, Identifier, and Reference code sorts are all based on what is sometimes known as ASCII sort - that is, the sort is not a true alphabetic sort as humans think of it, but rather as computers do. 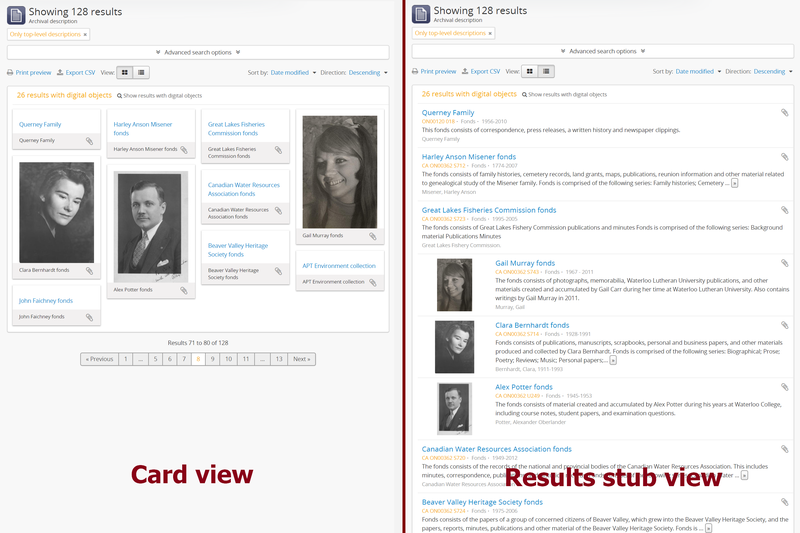 Similar to the Default repository browse view setting, this setting will determine if the “card view” (used by default on the Digital object browse page) or the “results stub view” (the default description search/browse view in new AtoM installations - called “table” in the related setting) is used when users first arrive on the archival description search/browse page. By default in a new installation, this setting is set to “table” - aka the results stub view. Note that this setting will not affect the use of the card view on the Digital object browse page - however, an administrator could change this by altering the path in the related node of the browse menu - for more information on editing menus, see: Manage Menus. The “Archival institutions” link in the Browse menu will not be hidden by default when this setting is changed. 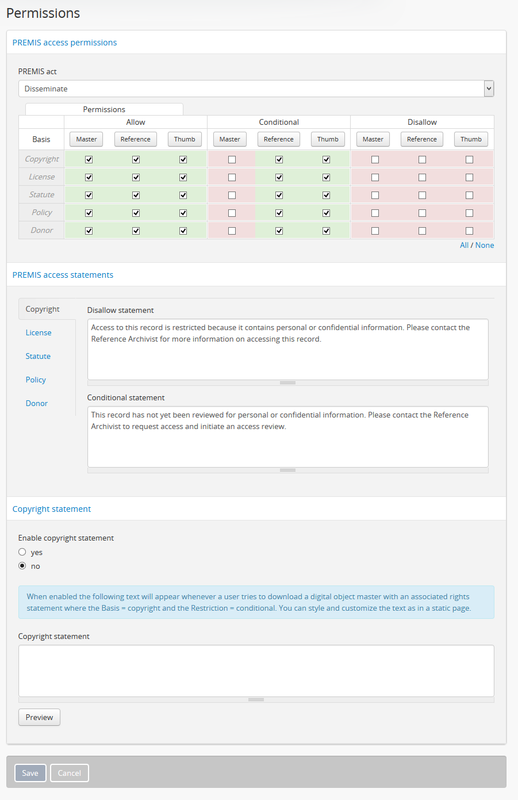 However, an administrator can manually remove this link by editing the Browse menu via Admin > Menus. For more information, see: Manage Menus. This setting will enable a basic audit log for archival descriptions in AtoM. 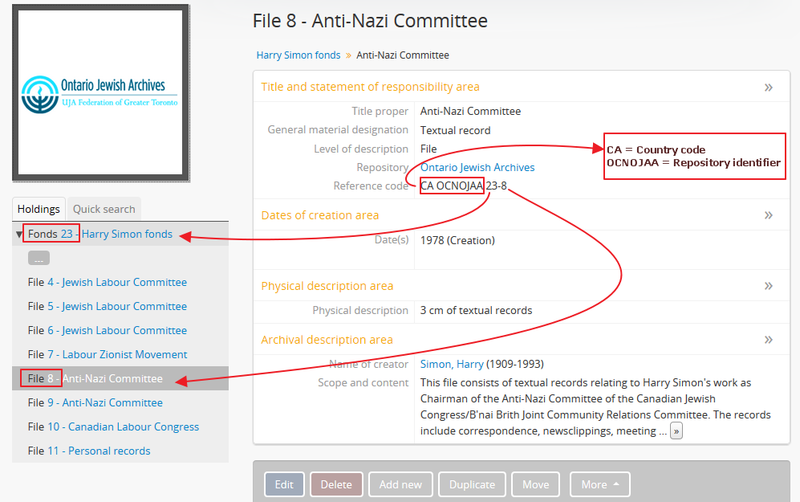 When enabled, the log will capture basic information on creation and modification events related to archival descriptions, including date, type (creation or modification), username, and/or related description title, depending on where the information is viewed. Note that the contents of specific changes made are not currently captured as part of the modification history’s audit trail. 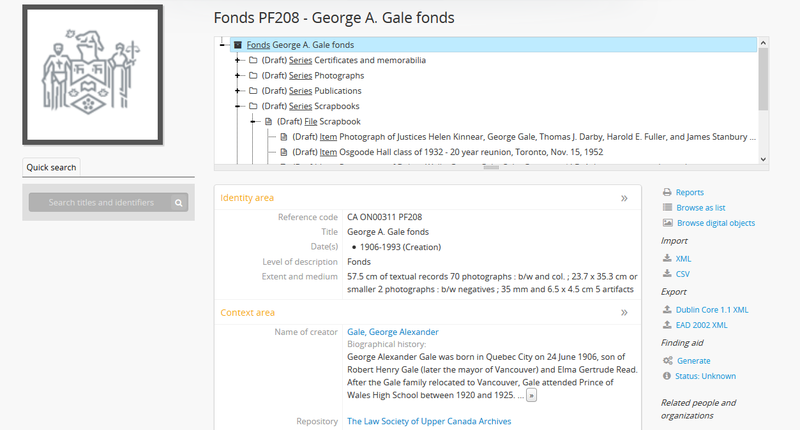 This setting determines whether new archival descriptions will automatically appear as draft records or published records. By default, public users (i.e. those who are not logged into AtoM) cannot see draft descriptions. 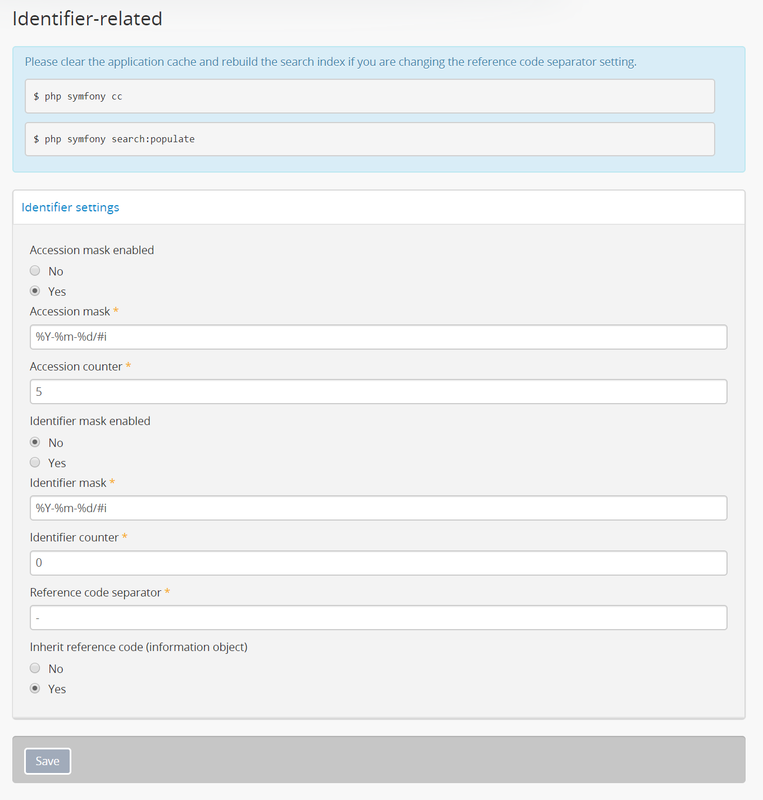 This setting determines whether or not draft records and retrieval information is included in the reports generated or not - that is, physical storage information such as location, container type, and name. When this setting is set to “Yes”, then reports generated will not include draft descriptions. Additionally, if physical storage information is hidden via the Visible elements settings, then physical storage information will also be excluded from finding aids. 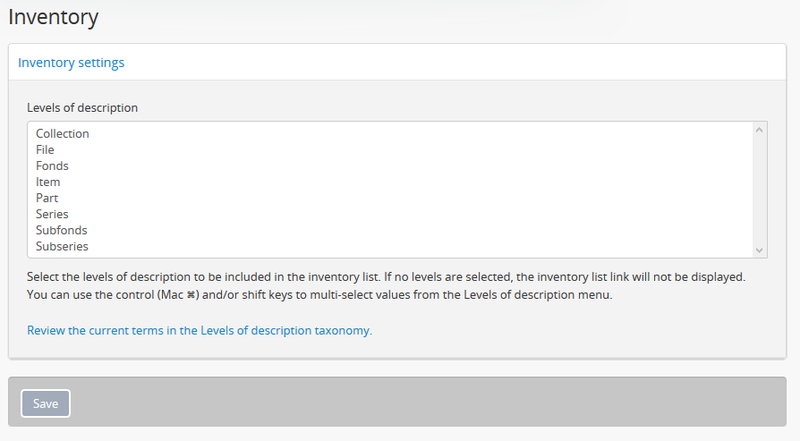 When set to “No”, then the reports and finding aids will include drafts and physical storage information. Whenever a digital object is linked to an archival description, AtoM will generate two derivative copies from the master digital object (e.g. 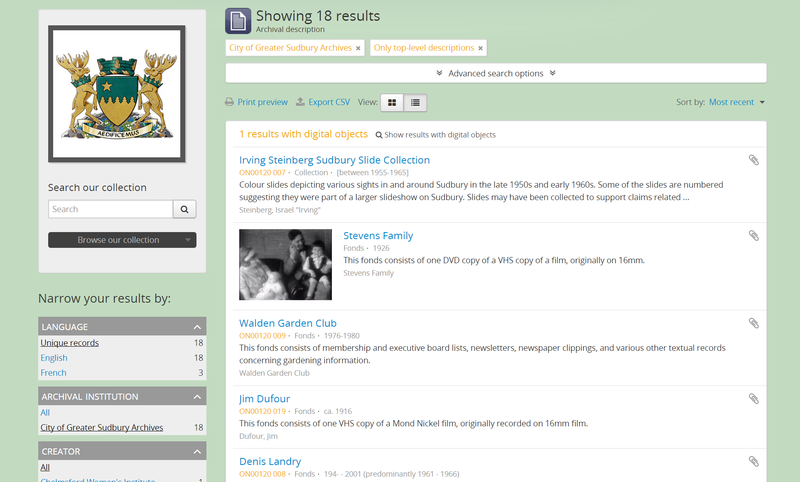 the original) - a reference display copy, used on the archival description view page, and a thumbnail, used in search and browse results, and in the digital object carousel. The following settings affect the way that reference derivatives are generated in AtoM. By default, AtoM will use the first page of multi-page content (such as a PDF) when generating the reference display copy and thumbnail images. With each new major public release, we incorporate community-supplied translations of AtoM’s user interface, which can easily be changed by end users by selecting a different language from the global language menu. 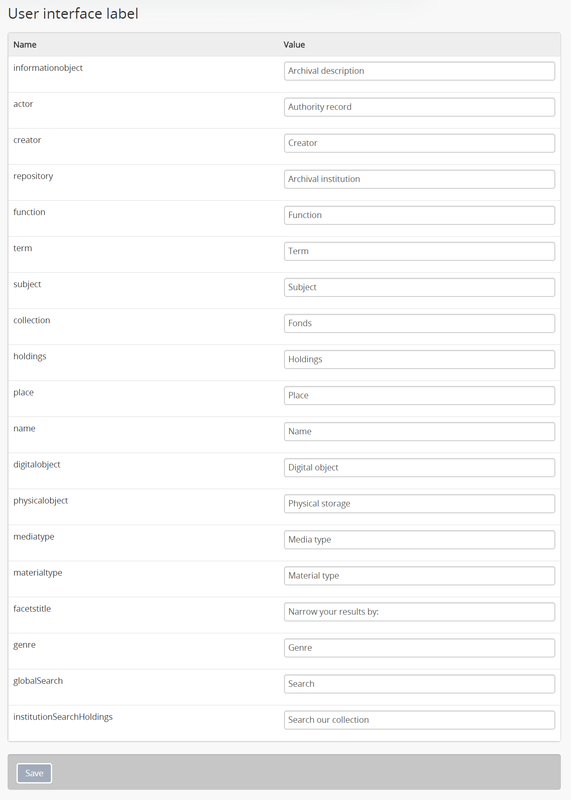 The language menu will display the languages that are currently enabled in your AtoM application. This setting determines what languages appear in the language menu. 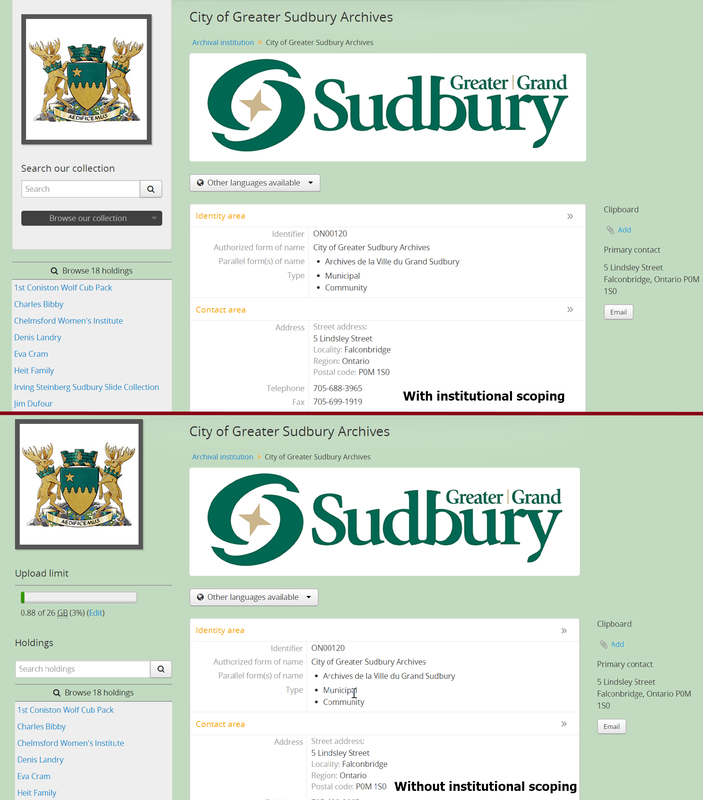 Settings in this section relate to archival description identifiers, as well as accession record numbers. AtoM can automatically generate unique identifiers for these entities based on a configurable mask. 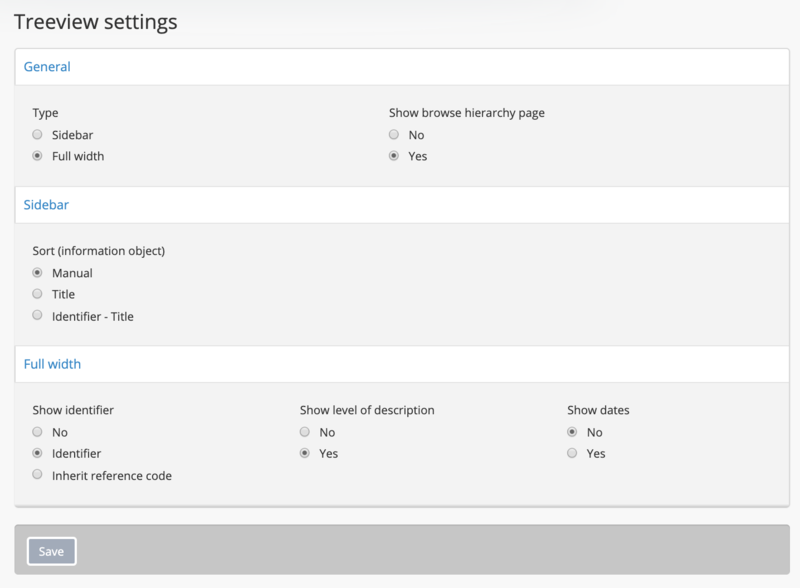 Users can also set reference code behavior for descriptions in this section of the settings. If you change this setting, it will be applied immediately on view pages. However, to see these changes take effect in search and browse results pages, a system administrator will need to clear the application cache, restart services, and populate the search before they are visible. 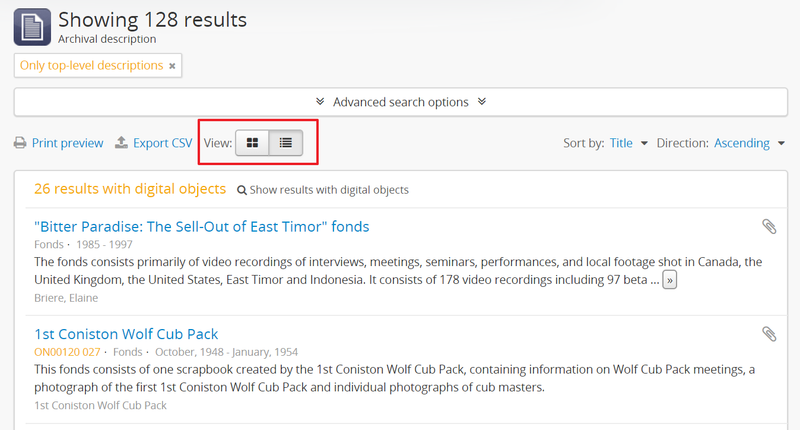 If you continue to see the previous reference code separator in search/browse results after performing the above tasks, be sure to clear your web browser cache as well. In AtoM, a reference code is a unique identifier string associated with an archival description, created through the combination of inherited identifiers from other related entities. While an individual description identifier is rarely globally unique (and is often not unique even in the same AtoM instance), by combining additional elements such as a the country code, repository code, and any parent identifiers, a unique reference code can be created, which facilitates international discovery and exchange. Markdown is a lightweight markup syntax for text formatting, originally created by John Gruber. As of the 2.5 release, AtoM supports the use of Markdown in both edit pages and static pages, via a PHP library known as Parsedown. This setting enables Markdown support in AtoM, which will allow for content added to edit and static pages to be styled using Markdown syntax. For more information on using Markdown in AtoM, see: Formatting. To ensure you are seeing the most up-to-date results, you may also want to clear the application cache and restart services (such as PHP-FPM and Memcached if you are using it for additional caching), and clear your web browser cache. Markdown is also used in the default text of the Privacy notification banner in new installations. If you are using the privacy notification and intend to disable Markdown in AtoM, be sure to review and update your notification message! AtoM supports integration with Google Analytics for the purposes of gathering statistics on page views, site usage, user location, and other data on site visits. All data collected by Google Analytics are stored and processed by Google, according to the Google Ads Data Processing Terms. By default in new installations, the Privacy notification banner will be turned off, meaning it will not display unless an administrator enables it. To enable the setting, log in and navigate to Admin > Settings > Privacy Notification. In the Privacy notification settings page, set the radio button to “Yes” to enable the privacy notification banner. Once you click Save in the button block at the bottom of the settings, the banner will immediately become visible. When users visit the site, the banner will remain persistently visible until the “Ok” button in the notification banner is clicked. 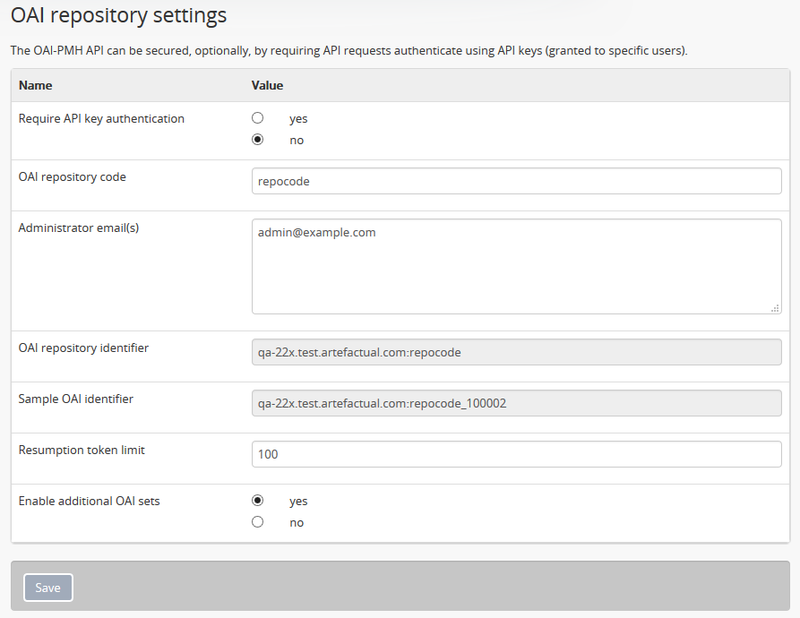 This section includes settings that administrators can enable to enhance the security of AtoM. To use this setting, you must first ensure that your server is configured to support SSL! If you enable this setting and haven’t first acquired and installed and SSL certificate and updated your site to use HTTPS, then you will end up locking yourself out of your site! The site title and description will appear in the AtoM header bar, if they are included in the default page elements. 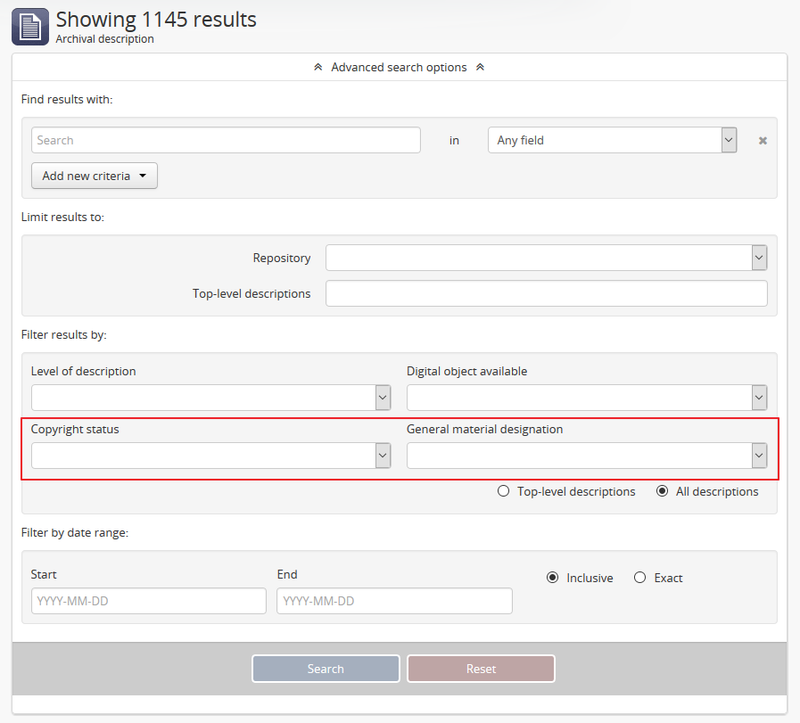 See Default page elements for an image of where the Title and description appear, and more about setting the visibility of default page elements. These are also used when your site is indexed by web crawlers for public results in search engines such as Google, Yahoo, Bing, etc. 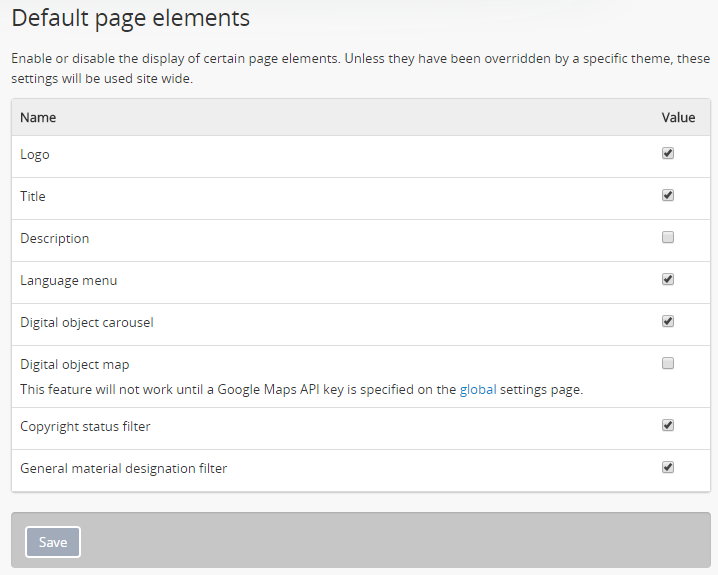 You can choose to hide them from public view via the Default page elements settings, but we recommending adding site information here even if you decide not to display the title and description publicly. The base URL is used to create absolute URLs included in exports (e.g. 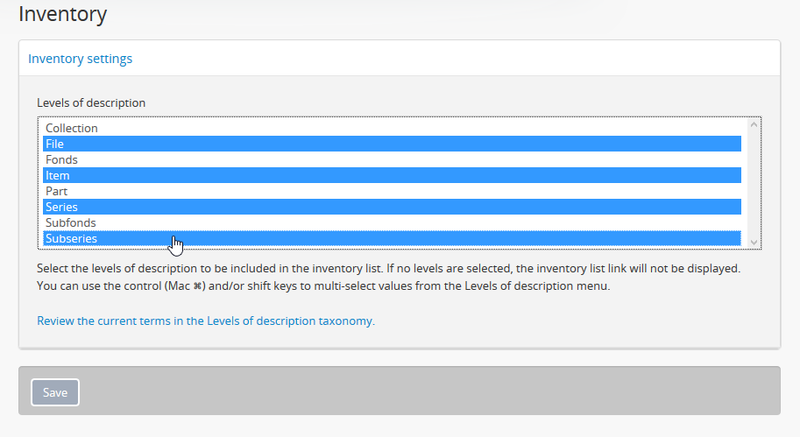 MODS and EAD exports, and the digitalObjectURI column in CSV exports). 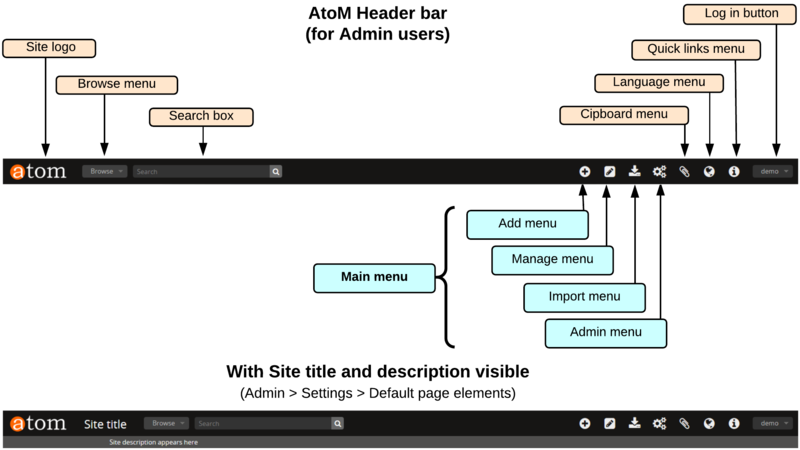 For example, your AtoM site is made up a series of web pages. Each page has a full Uniform Resource Locator (URL) something like http://www.your-atom-site.com/your-description. The Base URL is the part of this URL that does not change - in this example, http://www.your-atom-site.com. 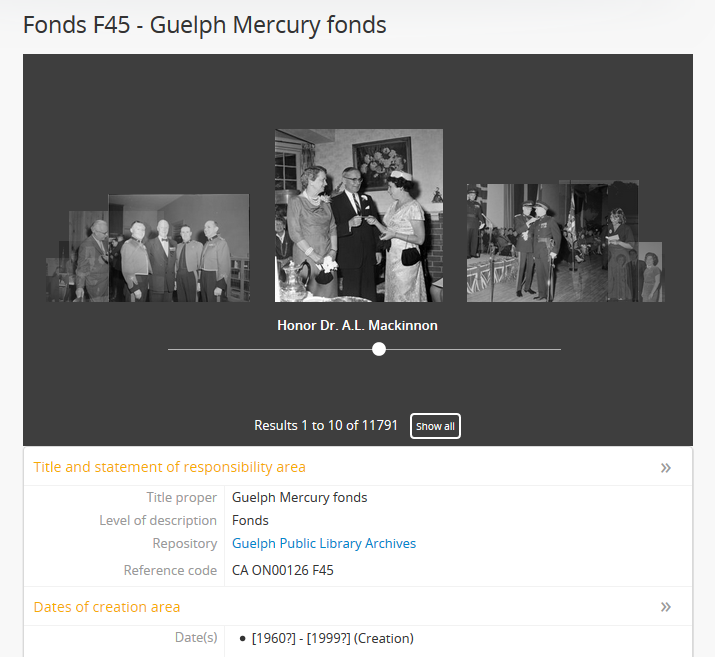 With the 2.5 release, administrators can also choose to show a browse hierarchy option on the archival descriptions browse page. This new feature will provide users with an additional way of browsing records held in AtoM - via a full-page version of the full-width treeview that contains all descriptions. globalSearch: the placeholder help text that will appear in the global search box.